Spend a day, or two, white water river rafting in Northern California through Class III rapids on one of our 10 mile rafting adventure trips! Together, you will raft as a team, water fight, swim, and play in one of God’s beautiful river canyons. The South Fork of the American River has two sections (the Upper/Chili-Bar Run and the Lower/Gorge Run) perfect for one or two days of adventurous California rafting fun. Each section includes about 4 hours of rafting time on the river during summer months. This gives us extra time during the day for spiritual devotionals, exciting team building games, leadership training, or just hanging out. At Rock-N-Water, every day is intended to be a full day of opportunities for fun, personal growth, and group unity. Our staff are not just California river rafting professionals, but they are also dedicated Christian youth workers committed to serving your youth with days customized just for you. Our Christian guides are looking forward to helping you experience river rafting in a fun and uplifting setting. Join us on a California whitewater rafting river today with your family or friends. By default, each of the above multi-day rafting trips have you arrive around 7 PM the night before (eating dinner before you arrive), and leaving around 6 PM (eating dinner on the road) at the end of your last adventure. If you would like to do the same on a one day trip, it’s just an extra $20/person. Founded in 1989, Rock-N-Water is a group of Christian whitewater rafting guides who want to impact young people with the joy of God’s Living Word, so they might come to know Jesus and pass on God’s love with excitement. We focus our program on biblical principles, and we use the help of nature, friendship, and challenge to develop character. We see the adventure on the river as a critically important tool for today’s Christian camp counselor. At Rock-N-Water we spend every day and night in God’s enticing playground. The adventurous challenges and tranquil beauty God gave us on the American River allow for a depth of ministry we know no other way of achieving. Christian led excursions in creation make for great opportunities of fun, help deepen relationships, and make positive spiritual growth almost unavoidable. River Classification System – Learn about the river class difficulty rating system, and how you can use it to get a general idea of how one rapid or river might compare to another one. Special Offers Rafting: Our goal it to make our everyday prices super special, but sometimes we do have special offers for white water rafting. Want a Northern California rafting trip that’s a little more adventurous? 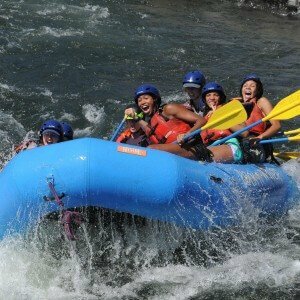 Try our Middle Fork American River Class IV California Rafting Trips. Again, please contact us if you have any questions, or are not finding exactly the rafting whitewater river adventures you are looking for.